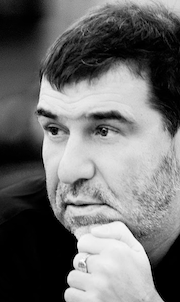 Evgeni Grishkovets was born in 1967 in Kemerovo. He became famous in Russia for his plays, which he writes, directs and acts in. He has been awarded two major Russian theatrical prizes for his plays which have also been performed in Germany, France and Poland. His first novel, “The Shirt” (2004), was an event in the literary life of Russia and brought him a prize for the Best Debut, and the Anti-Booker prize. Grishkovets lives in Kaliningrad.